Where are the Pancha Bhuta Lingams??? Located in five south Indian temples, the Bhuta Lingams are said to be places where Shiva manifested himself as the natural elements. and Tiruvanamalai (Arunachalam): (Agni) fire. The Saivaite temple of Sri Kalahasthisvara and Gnana Prasannambika in Kalahasti, is dedicated to Lord Shiva. Kalahasti, 38 kms to the South of Tirupati is revered as one of the Pancha Bhutha Sthalas. Here the Linga is "Swayambhu" and considered to be in the form of Vayu(wind). 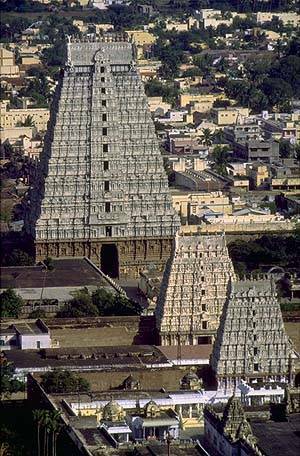 The remaining four Pancha Bhutha Sthalas are Tiruvannamalai(fire), Tiruvannaikaval(water), Kanchipuram(Earth) and Chidambaram(Sky). 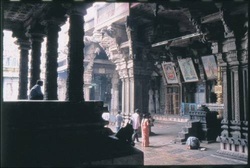 In this temple, the lamp inside the sanctum keeps flickering inspite of lack of any air inside. It is also considered as a Nava Graha Sthala dedicaed to Rahu and Kethu. This is the place where Rahu and Kethu grahas were blessed by Lord Shiva. 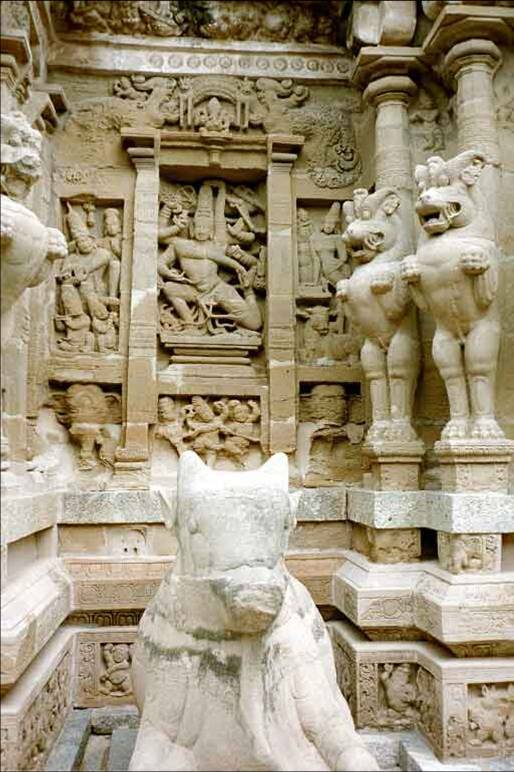 The other Nava Graha Sthalas dedicated to Rahu and Kethu are Tirunageswaram and Kizhaperampallam respectively. The Puranic version of the origin of the temple is that a spider(Sri), a snake(kala) and an elephant(Hasti) worshipped the Lord here and attained mukti. Hence the name of the Lingam was called as Sri Kalahasthiswara. His consort is Gnana Prasannambika. 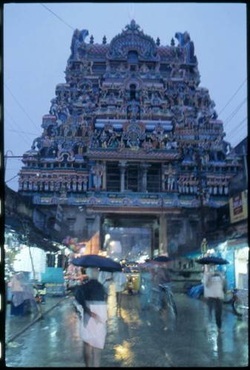 The deities of Balaganapathy, Annapoorni and Viswanatha are enshrined here. Patalaganapathy is an underground cell. A river,the Swarnamukhi, flows by the temples. 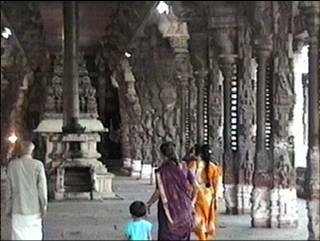 Sri Kalahasti town has been famous for its manufacturers of "Kalamkari",or temple clothes and hangings. 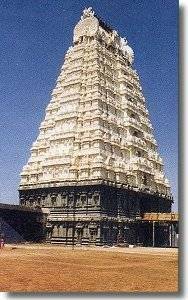 This temple, 2kms from Srirangam is dedicated to Lord Siva. 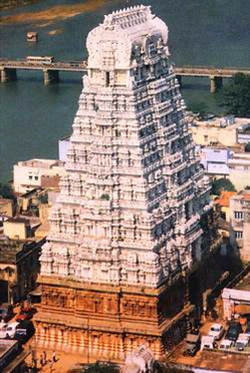 It is also known as Jambukeswaram. 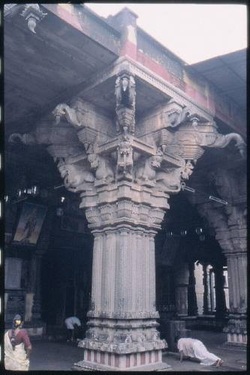 This is the Appu Sthalam among the Pancha Bootha Sthalams. An elephant and a spider were offering worship to the Lingam simultaneously. The spider would spin a web giving cover to the Lord. The elephant would bring water in its trunk to do Abhishekam to the Lord. He found the web in the way & destroyed it. The spider spun the web again & the elephant destroyed. This continued & one day the angered spider got into the elephants trunk to disturb him. The elephant struck his trunk against a rock. The Lord was pleased with their relentless devotion & both the spider and the elephant attained moksham. Since an elephnat worshipped the Lord here, the place is known as Tiruvaanaikaaval (Aanai in Tamil-Elephant) This place is also known as Jambukeswaram. There was once a rishi who performed tapas in this region. The Lord was pleased with his prayers & agreed to give darshan to devotees here as Jambukeswarar. The temple is one of the tallest temple towers in South India, having a total of 11 stories which are adorned with beautiful sculptures. It is in this place that Shiva is worshipped as Prithvi or earth which is one of the five basic elements of the physical world. 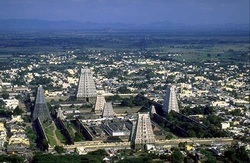 Its tall south Rajagopuram, which is at a height of 58 metres looms majestically into the sky. Another ancient temple, renovated by the Pallavas, the Cholas and the Vijayanagar Kings. 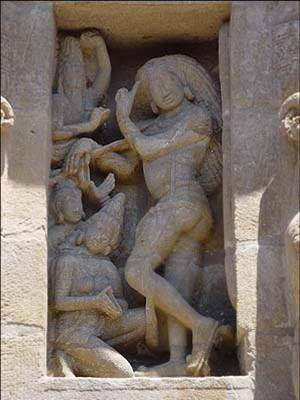 Kailasanatha Temple, Kanchipuram Shiva the Enchanting Mendicant, with sandals, unbound hair, and carrying his few possessions on a staff, is shown as a youthful ascetic, being worshiped by the wives he seduced. A disenchanted husband raises his fist in the upper left corner. 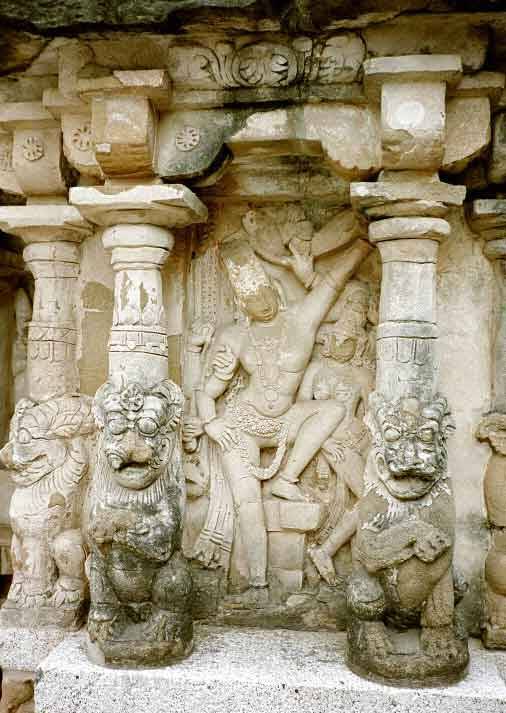 The poise and gestural language of these figures (the flexion of Shiva's left leg and sandaled foot, his upward-pointing left hand, the outraged husband's martial stance, and the kneeling adoration of the seduced wives) lend vitality to the composition. Shiva's upward-pointing left hand is echoed, a couple of centuries later, by the upward-pointing right hand of his disciple Sambandar (Sambandha).